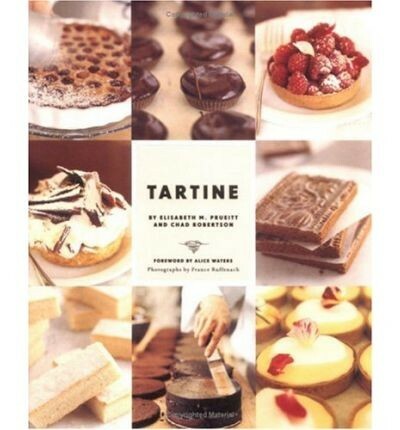 Tartine was chosen by Corby Kummer of the Atlantic Monthly in the New York Times list of selected top ten cookbooks of 2006. It was also nominated for a James Beard award for the photography of France Ruffenach. The Quiche ... changed my whole quiche world! The humble lemon bar is elevated to a whole new level with their recipe for Lemon Bars on Brown Butter Shortbread. Nice strong lemon flavor. I've made this recipe multiple times each with a different fruit. ALWAYS a hit. The almond is refreshing. My favorite version was with plums. I did not have a glass 8" round cake pan, so I used a glass 8" square pan. The round pan would have been extremely full. I question the pan size, as the recipe notes "makes a 10" cake". The batter comes together easily. I used raspberries and blackberries for the fruit, maybe 3/4 pint; the fruit on top was not too crowded. I had a real problem with the baking time. It was very hard to tell when it was done, as the recipe mentions. I did use a knife to lift up the fruit, and after 40 min, it was definitely not done. But even after 60 min, it didn't seem done. It finally seemed all the way done in the center after 75 min, but by that time, the edges were quite dark (although not burnt) and ended up rather dry and hard. I turned oven down to 325 after 50 min to prevent overbrowning. Anyway, the flavor was very good (almonds and fruit - yum), although it's extremely rich and sweeter than I'd normally make a breakfast cake. Would tweak ingredients, pan, and baking time if I made it again. Very good. The scones are very large and tall, requiring a longer than usual baking time. I tend to make mine a bit flatter. The currant version retains its shape best. I made the fresh strawberry variation and the scones spread a fair amount, and also leaked some butter, probably due to the moisture from the berries. Perhaps freezing the scones before baking would help (I did freeze the strawberry pieces before mixing them in, as instructed). Nevertheless, they were delicious. These are wonderful. I loved the tang and texture the buttermilk provided. As the other poster mentioned, these are large. I ended up with nine scones and it took 27 minutes to bake. I love making scones and these are among the best I have made- or eaten! These are excellent. Based on the comments here I made them a bit smaller than the recipe calls for (cutting into 16 instead of 12 scones). This is a good size and they were perfectly baked at 25 minutes. This quiche has spoiled me for any other. I love the tangy flavor from the addition of the creme fraiche. It's adaptable to the addition almost any type of vegetable as it comes into season, but I'm partial to chard. When I'm in a rush, I make a quick version without a crust in a deep pie dish. I made 1/2 recipe in a 7" tart pan. I baked the crust from frozen and it took a good 20 minutes extra to brown, plus leaked some butter, but otherwise turned out super flaky. The pie itself was absolutely delicious, although the banana flavor does not stand out. The only problem we had was cutting through the very crisp crust and chocolate layer without sending pieces flying across the room. (Tip: tines of fork should face downwards to gently but firmly separate bites.) I wish I had seen yassoma's note before making this because I did spoon the chocolate on the crust. I tried this tart at the bakery and I loved it so much that I had to make it at home. This was definitely labor intensive, but I found that the crust did not brown as much as the version I had in the bakery. I followed it to the T, but it wasn't as tasty... and I used two full vanilla beans for this recipe. The crust, since it was coated in chocolate and the tart is a refrigerated tart, WAS SO HARD! Which made it difficult to eat. So, reader, take note to BRUSH the chocolate on, a very thin layer. Don't use a spoon. I don't know if I'll make it again, simply because it wasn't worth the intense effort. Tasted good, but didn't look neat and was difficult to eat. I made 1/2 crust recipe (which makes 2 9" crusts, so I have one left) and 1/2 pastry cream recipe (I ate the small amount of extra) the day before, then baked the crust, made the Bavarian cream, and assembled the tart a few hours before serving. It's a lot of steps, but overall doesn't take that long. The Bavarian cream isn't stiff from the gelatin; it has a light, billowy texture. (Some of that was left over too, and I look forward to enjoying it with fresh fruit). The recipe makes a shallow 9" tart, so it isn't huge. I think it serves 6-8, depending on appetites. I used a combination of peaches and berries from the farmers' market; use the best fruit you can find here, as the flavor is key. Everyone loved it. The crust took about 25-30 minutes to bake. Only half the cream fits in the shell unless you have a deep-dish tart pan. I could not find rose geranium leaves, so used rose water. I was worried about using too much, but may have used too little - it wasn't that noticeable in the tart, except perhaps to lend an unusual background note. Next time I'd try vanilla, orange, or fiori di sicilia in the cream. I glazed the berries with raspberry jam, as I was refrigerating the tart, plus the berries weren't totally sweet. Overall, a lovely tart. I have had this cake from the bakery. I used limes from my tree and frozen passionfruit puree from the mexican market, so no need to strain. The cake itself came together pretty easily but the sponge cake made more batter than would fit in my 10" springform, so I made a mini 6" cake on the side - to be frozen and used on a different day. The passionfruit cream is bright, tart and not too sweet. The cake, a little fussy to assemble, cutting into layers, lining springform pan with plastic wrap is a bit of a wrestling match(acetate collar might have been easier but maybe this was adapted for home bakers) brushing layers with lime simple syrup and layering with the passionfruit bavarian. Once chilled, I only added whipped cream and toasted coconut to the top - did not frost the sides - they looked okay exposed and it was an easier version. I felt it replicated the bakery version pretty well and it makes a beautiful birthday or dinner party cake. Delicious moist and wonderfully dense with dates and toasted walnuts and a chewy, crystallized top crust. Lined bottom of pan with parchement (made a sling across bottom and short sides of loaf pan. Subbed brown sugar for 3/4 cup of the white and sprinkled top of the loaf with Demerara sugar before baking; skipped the sliced banana. Good rich flavor with caramel notes from the brown sugar and dates with a sweet top crust. This recipe will definitely go into rotation. First recipe I am trying out of this book. As always, I modified to bake this with gluten free flour. I used 1 cup of GF flour mix and 2 T. of Betty's four flour blend to replace the the AP flour. I omitted the walnuts but topped my loaf with toasted pecans and sanding sugar. I did not have any fresh bananas so I did not top my loaf with banana slices. It came out perfectly- moist and flavorful and absolutely delicious. The sugar pecan topping is key. This cake has a lovely caramel flavor from the dates- so delicious. It is a bit sweet for a breakfast banana bread and doesn't seem like breakfast- more like dessert. Some notes about process: it took an extra ten minutes to bake and even though the batter only reached 3/4 of the way up the loaf pan, it overflowed and made a mess in the oven. Maybe my bananas were too large? Next time I won't fill the loaf pan as much but there will be a next time! I enjoyed this pumpkin cake a lot. Lots of great spice notes, and very moist. My only complaint would be that I, too, would prefer a bit stronger pumpkin flavor. Not sure if I would try to adjust this cake to fix that or just take the parts I like from here (spice types/amounts) to another cake and adjust that one. I substituted white whole wheat flour for the all-purpose with no adverse affects. Currently enjoying it toasted and topped with cream cheese, and it is very nice. Very moist and delicious. I liked the heavy spices. I used white whole wheat flour but otherwise followed the recipe, mixing by hand. It took 65 min to bake, but still sank very slightly at the top. We loved it, but it's so fattening, I'm not sure I'll make it again. We loved this cake. It had a beautiful dome, luscious texture and wonderful, spicy taste. Mine took 70 minutes to bake. This is a great spice cake. After reading the comments below, I used roasted kabocha squash in the hopes of getting a more assertive "pumpkin" flavor, but it still tasted mainly of the spices. Definitely delicious though! I added a streusel topping that I had left from another recipe and added 2 teaspoons vanilla to the batter. Cake is moist and light and rises into a tall loaf. My version was a little less dense than the one from the bakery. I prefer my mom's pumpkin bread which is definitely heavier and has more pumpkin flavor. Served with the Bourbon Hard Sauce which is a great topping for this cake (cut way back on the bourbon though - really strong otherwise). Not sure I will rush to make this again. Delicious, moist cake that's easy to make (heavy machinery optional). The pumpkin definitely took a back seat to the rather assertive spicing but we loved it anyway. I'm another fan of this cake. I needed 65 minutes to bake it through and it was perfect. The sugar top does make it satisfyingly crunchy on top. We enjoyed this cake - made for a nice change of flavour from the usual tea cake. Froze the leftovers and ate them toasted. This is an excellent zucchini teacake. The marmalade gives it a lovely flavor that nicely compliments the toasted walnuts. Mine took 70 minutes and the texture was perfect. A friend had given me homemade Meyer lemon-orange marmalade, so I used that in the cake, and it worked well. There is plenty of sugar in the cake (although it isn't overly sweet), so the marmalade can be tart. The marmalade adds a backround spice note to the cake, but otherwise isn't too noticeable. I used white whole wheat flour, which worked fine, and only half the nuts (to save a few calories). No need to use the mixer for this recipe. My tea cake was actually a bit overdone after 60 minutes, but my oven may be running hot. It was very good, although I prefer the Cook's Illustrated recipe. If you make this, don't skip sprinking the sugar on top, as it really adds a nice crunch and flavor. Made the Bourbon Butter to serve with the Pumpkin Tea Cake and word of warning, it provides a huge hit of bourbon. I ended up doubling the butter and sugar to compensate for all the bourbon in the first batch - I used a Smoked Maple Bourbon and while it is delicious, it is very strong. I love, love this cake at the bakery and this recipe is a winner. I added the poppy seeds, although not called for in the recipe so I could match the bakery version. I would like the loaf to be bigger, the slices are smaller and less square than the version at Tartine (double recipe, larger pan??). The almond paste makes this so moist and flavorful along with the tart lemon is such a wonderful combination. I made several variations of this to find which one I liked the most : following the recipe by the book, adding poppy seeds as at Tartine, adding poppy seeds + folding in some whipped cream. It probably could have baked longer, but we were overzealous. The whipped cream version came out of the pan easiest. One of my kids proclaimed they wanted to spend all of their toothfairy money on that same cookbook. This was the first recipe I made from the cookbook and I loved it SO MUCH. I made the almond paste myself, but I'll try store-bought next time. SO GOOD. Seriously, rich and tender, and that crystallized crust! Oh man, yum. Very soft and tender. Easy to eat way too much. I did not bother sifting the flour. I also used the mixer the whole time, using the stir setting to add the zest and flour, with just the final mix by hand. The photo next to this recipe shows poppy seeds, so I added a couple of tablespoons at the end. So delicious! Wish it weren't so fattening. I made this twice this fall and it's just perfect. Shatteringly crisp (yet still chewy underneath) topping and caramelized edges on the apple filling. I did prefer when the apples were cut slightly larger the second time around, as the long cooking time (1.5 hrs) melts the pieces into almost an applesauce consistency otherwise. I agree with the paddle vs. whisk decision of jzanger. The whisk with the cold butter (which is definitely necessary for forming the patties) would be impossible. I used 2 lbs apples and half the topping, which seemed like a good ratio. I also used a paddle, not whisk, to mix the topping. The topping was different, like a cinnamon cookie. It was tasty, but I prefer a more traditional crumble topping. (Also, the cookie topping didn't look that attractive.) The crisp was done after 1 hr 15 min, at which point the apples were almost mush and the topping nicely browned. There isn't much sugar in the filling; it tasted delicious with vanilla ice cream. Completely lives up to its name. The top is really nicely crisp. I enjoyed trying this new technique (many flat patties covering the top instead of a "crumble" topping) and loved the contrast between the heavily cinnamon-spiced topping and the lemony apples. Prueitt's tip on slicing the apples was very helpful as I used apples of varying sizes and this allowed for somewhat more uniformity. Baking time for me was spot-on as well. The only goof in the recipe is the instruction to use the whisk attachment for mixing together the dough. Cold butter plus a whisk attachment is never a good combo. Use the paddle. I'll definitely make this again! note: there are no oats in this recipe, for those looking for that type of apple crisp/crumble. The season for tart cherries is way too short, so short that I often eat them all plain. But, this recipe is great for a party and the presentation is beautiful. I often buy bags and bags of frozen cherries at the farmers market and I love to pull them out mid-winter to make this lovely treat. It's a blast of summer when you bite into those cherries. These bars are very assuming at first glance. Try them once and you will be hooked. They are simple to make and are a go to recipe when I'm tight on time. They are buttery with great texture. I made this for my Christmas cookie plate. Tasted so good, use top quality butter. Good size for small nibbles with coffee but you may want to slice larger. These are fabulous! The authors add "kitchen notes" for every recipe, including this one.. These notes are their secrets for success. I used coconut instead of walnuts, and used Trader Joe's Bitter sweet chocolate instead of regular chocolate. Yummy. Froze well. Spread a lot. Baked for 11 minutes and cooled on Silpat. Best cookies I've made in a long time! I used chocolate chips. I made them about half the size recommended in recipe and froze some batter for later. They came out chewy and crispy on the edges. Highly recommended! This is one of my favorites and a regular that I turn to when I have extra egg whites from ice cream making. My preference is to substitute hazel nuts for the almonds. I only got as far as the choux pastry, which ended up in the trash. Everything was great until I took them out of the oven. Perhaps they weren't quite done, but I immediately poked holes in the ends as instructed, and they all deflated. I googled this problem and learned that holes should not be poked until the choux is cool. I've only made choux a handful of times, but never had this issue before. An excellent version of classic lemon bars. The butter isn't actually browned, but the crust is prebaked until golden brown, resulting in a more flavorful, sturdy crust than most lemon bars, The crust was fairly thin - barely seemed like enough to cover the bottom of the pan - although it was adequate. But if you like more crust, perhaps increase it by 50%, as nadiam1000 suggests. I didn't use the pine nuts. I used Meyer lemons for the filling, which was absolutely delicious. This is our families new go-to recipe for lemon bars. My go to lemon bar - I love them at the bakery so I am thrilled to make them at home. I do not use pine nuts in the crust and sometimes I increase the crust by 50% as I love the shortbread. I made these little beauties and paired them with strawberry ice cream for a class when I was in baking school. I can't remember the assignment--something for plated desserts probably--but I do remember these. I'm not a huge chocolate fan so these are the perfect size to me, packing in great chocolate flavor in just a couple of bites. As noted above, go ahead and use the good chocolate for these. This didn't turn out exactly as I expected the first time, but it was my first candy making experience. I've fiddled around with it a bit, and had a lot of success! I ended up adding more water and molasses to the mixture to loosen it up a bit and make it easier to spread out in the pan. The end result was buttery and melt-in-your-mouth delicious! This is my favorite brownie recipe! Excellent brownies! They describe them as leaning more toward fudgy than cakey, and I guess that’s true. I found them to be nicely dense and chocolatey, but with nice crispy edges and not at all heavy. Recipe calls for them to bake around 25 minutes, but ours needed closer to 35-40 minutes. These and the ones from the “Baked” cookbook are my two current favorites. I made 1/2 recipe for 3 people, using 8 oz ramekins (which were filled nearly full). The recipe is simple to make. I used Meyer lemons, which had a nice flavor. The cakes puffed up in the oven, but deflated slightly upon cooling. They were light and delicious, particularly with fresh blackberries. I’ve had my eye on this recipe for a while and I finally made them yesterday for Thanksgiving despite my usual rule not to make something for the first time on a holiday. I made them early in the day and re-heated/crisped them in the oven just before serving, which worked just fine. The basic recipe was delicious, but I’m also interested in the additions of caramelized onions or duxelles suggested in the notes. These savory little bites were one of the hits on the table and it was tough to get a second helping. Everyone asked for more and insisted they become a new tradition. Made for my brother in law's wedding and stamped his name and his new wife's name on them. Everyone was in awe. Very rich and flavorful. With so many adjustments, I don't feel entirely qualified to comment on this. In the recipe's headnote, though, they suggest that you can vary the seasonings any-which-way, so.... here we go! Since I was attempting to use up nuts that I had on hand, my final types/quantities did not match up. All were the same variety, but none (except the cashews) were raw. The rest were roasted, or blanched or... you get the picture. And I only had about 2/3 the total amount called for. I did, though, keep the seasonings at the full amount. I had excess agave syrup on hand, so I used that instead of corn syrup. I also used a chili con carne seasoning (ancho chile powder, oregano, tomato powder, etc.) instead of straight cayenne, as I wanted them to not be too spicy my small nut-loving squirrel of a son. I needed to bake them about 5 minutes longer than suggested, but that could have been my oven. Even with all those changes, these nuts will not be around long. They are soooo good and so adaptable. Note that this recipe makes 4 crusts. I cut it in half to make 2 (only needed one, but will freeze the extra); I did not try just making one. Read the instructions carefully, as the order of ingredients and mixing technique is somewhat unusual for pastry - more like a cake. It was easy to make and roll out. The recipe says the dough holds its shape during baking, without needing pie weights, and it mostly did, although my edges slumped slightly. I also needed to bake the crust 5 min longer to fully bake it. I would definitely use this recipe again. This is a basic tart dough and the one that I turn to most often. It's virtually fool proof and can easily be scaled up or down depending up on your needs (or room in your freezer to save some for later). I tend to find myself following the suggestion of using the egg wash on the partially baked shells and it works well. Rhubarb was finally available at the market this weekend so this was filled with an Orangette recipe for a Rhubarb Meringue Tart--also fabulous! I love the fact that this recipe requires whole eggs and not only yolks, which makes for a much lighter pastry cream and does not leave you with leftover egg whites. Tastes great as well! I also love that this recipe calls for whole eggs. Also, most recipes that call for it use the whole amount, or close to half the amount (and it's easy to cut the recipe in half), so you aren't stuck with leftovers. The only tricky part is that the cream must boil to thicken the cornstarch, so you really have to watch it. But you have to closely watch any pastry cream not to curdle it. I'm a big caramel fan so this won't be surprising. I loved this basic sauce. It is easy to make and holds for a long time (a month) in the fridge. I used it on the Bread Pudding with the addition of some fruit, but I can imagine it would be good on ice cream or any variety of other desserts. The golden color and the consistency makes it a good choice for finishing a plain or fancy dessert. Featured in Food52's September, 2017 Baking Club. Follow link to see how to participate. ...this stuff is like crack. Pure candy crack. Definitely dangerous, definitely best to share it before I scarf it all down myself! And did I mention that it took like 20 minutes? From Amy the Tester: These were delicious! The addition of molasses gave the caramel a depth that is not usually present in a caramel apple. Every once in a while, a cookbook comes along that instantly says classic. This is one of them. Acclaimed pastry chef Elisabeth Prueitt and master baker Chad Robertson share not only their fabulous recipes, but also the secrets and expertise that transform a delicious homemade treat into a great one. It's no wonder there are lines out the door of Elisabeth and Chad's acclaimed Tartine Bakery. It's been written up in every magazine worth its sugar and spice. Here their bakers' art is transformed into easy-to-follow recipes for the home kitchen. The only thing hard about this cookbook is deciding which recipe to try first: moist Brioche Bread Pudding; luscious Banana Cream Pie; the sweet-tart perfection of Apple Crisp. And the cakes! Billowing chiffon cakes. Creamy Bavarians bursting with seasonal fruits. A luxe Devil's Food Cake. Lemon Pound Cake, Pumpkin Tea Cake. Along with the sweets, cakes, and confections come savory treats, such as terrifically simple Wild Mushroom Tart and Cheddar Cheese Crackers. There's a little something here for breakfast, lunch, tea, supper, hors d'oeuvres - and, of course, a whole lot for dessert! Practical advice comes in the form of handy Kitchen Notes. These hows and whys convey the authors' know-how, whether it's the key to the creamiest quiche (you'll be surprised), the most efficient way to core an apple, or tips for ensuring a flaky crust. Top it off with gorgeous photographs throughout and you have an utterly fresh, inspiring, and invaluable cookbook. There are three measuring systems in the recipes: standard American volume measures, imperial fluid ounces and ounces, and metric milliliters and grams.